There are many good reasons to establish recycling plans. Some of them are economic, some are environmental, and some are quality of life issues. Communities around the country and around the world are establishing new collection and recycling programs, or enhancing existing plans. Some of the programs are mandated at a local community level. But there is an increasing amount of legislation originating at the state level. There are even federal requirements that come into effect. Some international treaties and agreements will also have long range implications on recycling programs. Many consumer and industrial products require major amounts of raw materials. Paper goods, including office materials, newspapers, and household items incorporate material sourced from wood. New construction also often uses tremendous amounts of wood. Ironically, demolition is often required before beginning construction. The demolished material that is usually taken to a landfill site may contain a large proportion of wood material. Electronic devices such as computers, printers, monitors, music devices, phones, and televisions use glass, plastics, and a number of different metallic components, some of them being rare and expensive items. Care must be taken when disposing of these parts, as some of the metals may be hazardous. Perhaps the most obvious target for effective recycling are automobiles. They use tremendous amounts of raw materials, including steel, aluminum, copper, glass, rubber, and plastics. All by themselves, modern vehicles hide major electronic systems. The life cycle of a car is relatively short. It becomes quite clear that major recycling efforts must be involved at the end of the cycle. Industrial scales play a major role in these efforts. Clearly, the economic component of any recycling program is based on the amount of material being processed. If it is mandated that a certain percentage of a television be recycled, it is necessary to know the beginning weight of the device, and the weight of each type of material that is collected. When the recycled material is sold, it is sold by weight. Accuracy is important from an economic perspective. Depending on the nature of the recycling facility, different types of electronic scales may be appropriate. The most common types are platform scales. These should have a large enough capacity to handle the expected loads, usually in the range of 1000 pounds. A well designed unit, such as those from Arlyn Scales, offer a variety of platform dimensions, depending on the types of containers used for collecting material. Smaller containers can use the standard size platform of 20” x 27”. Larger boxes or totes may need platform sizes of 36” x 36” or even ranging up to 48” x 48”. A low profile platform is a very convenient feature. Because the scale may be loaded by hand, or with a manual cart, it is beneficial to reduce the height that the material must be lifted or pulled. The Arlyn Scales provide a low height of only 1 7/8”. Of course, the platform scales must be very rugged. The recycling area may include motorized carts or even forklifts. It is not unusual for the load to be place on the industrial scale with a significant amount of force. Unfortunately, this could damage the operating component of the digital scale, known as the load cell. To protect against this type of abuse, high quality platform scales are constructed with load cells made from stainless steel. As an added benefit, this type of material withstands various types of liquids that may be found in these types of environments. If the materials being recycled are particularly corrosive, it may be necessary to specify a platform scale that is constructed completely from stainless steel. In the very worst situations, a special corrosive resistant epoxy coating is available for the scales. If the expected loads on the scale will exceed 1000 pounds, a large floor scale should be chosen. These units are provided in capacities of up to 20,000 lb. They also have much larger platforms, generally ranging from 4” x 4” up to 8” x 12” for some of the largest recycling bins. These electronic scales are also available with stainless steel load cells for protection against harsh use. 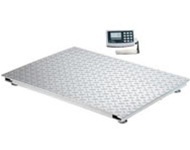 Both the platform scales and the floor scales are available with communication connections that allow the weights of the containers to be printed on labels, tags or cards. They may also be connected directly into a computer system. Data on the materials being recycled can be collected into a database or spreadsheet program. It can also be directly entered into the financial software being used by the recycling facility.